Google Maps now offers the option of getting walking as well as driving directions, one of my Computerworld colleagues notes in his blog. It's a great idea in theory, but the algorithm is a bit lame at times. I'm guessing that Google is considering things like shortest distance and ability to go the "wrong way" on one-way streets when giving its walking suggestions, but not other important things such as crossability of intersections on foot, appealing streetscape, or even presence of sidewalks. The system correctly changed its route for going on Speen Street to North End Treats on Rte. 30, routing a car down Leggat McCall connector but a pedestrian down Speen Street (it would be impossible to walk on Rte. 30 the first way, because of the traffic pouring off the Turnpike in between). 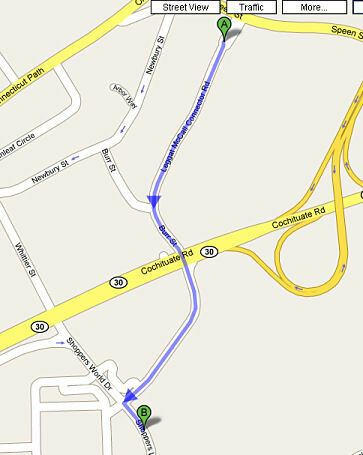 However, Google Maps suggests pedestrians walk to Shoppers World from the Leggat McCall connector (see below) by crossing Rte. 30 and continuing straight on a road with no sidewalk and multiple lanes of fast-moving traffic -- an extremely dangerous route on foot.